Usually September is that month which rolls in and spells the coming of Fall with hot days and cool nights! Yet, this month has already been upended by hurricane Harvey, fires, flooding, and now Irma. Harvey flooded food warehouses in Houston and the remaining food was quickly depleted by the shelters. Trying my hardest to stay away from the “dark side” I sent a truckload of food to Houston (simply bread, veggies, and water). The people I encountered in this process were generous nice people, and loving beings. That’s my America and it was heartwarming to feel it. Enough philosophy (but I do remind you that smiling is free). The first day of Fall (Autumn) is September 22. That means the start of PUMPKIN EVERYTHING. We know you’ve been anxious and we’ll bring back pumpkin scones, muffins, donuts, cakes, bundt cakes, ETC. In October, watch for Halloween cookies and cupcakes….oh my! I’ll be reading candy ingredients to try and help! 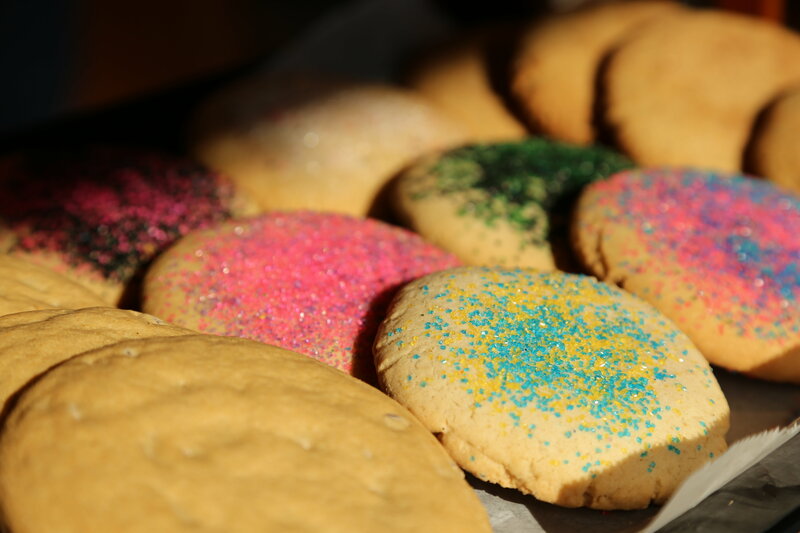 If you want smaller sugar cookies for parties order them early. (6/$9.99). We’ll do our best. I’ll get the Thanksgiving specials and prices out early and PLEASE order early. We have many new members of our clan and we want to serve everyone. For us to stage and prepare the right amount of dressing, stuffing, pies, rolls etc we need your pre orders! Lastly, we are growing, WOOHOO, and looking for another part time employee. The position is 18-20 hours per week, Tuesday through Saturday. Please help us get the word out. Visit our website and discover our tasty product menus.